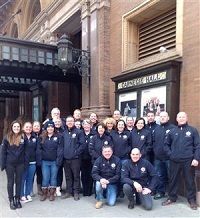 Cheshire Fire and Rescue Service Choir will be recording their signature tune, The Rising, for charity after taking part in a critically acclaimed concert at New York’s famous Carnegie Hall at a tribute performance to fallen firefighters at Ground Zero. The Rising is a song written by Bruce Springsteen after the terrible attacks in America in September 2001. The song is specifically about a firefighter in one of the twin towers realising that he is not going to make it. The song will be released as a digital download and all proceeds will be donated to The Fire Fighters Charity. The choir is heading to Parr Street Studios in Liverpool in July to record the song and plans to release it later in the year. Macclesfield Watch Manager Phil Marke, chair of the choir, said: “It was the Ground Zero performance whilst in New York that made us decide to record the song professionally and release it to raise funds for the Fire Fighters Charity. “Performing The Rising is our way of never forgetting our colleagues in America. The moving song holds a special meaning for every single member of the choir as it was written in reaction to the September 11th 2001 attack on the Twin Towers in New York in which 341 firefighters, 60 police officers and 10 paramedics lost their lives. “But, for the choir, the song isn’t only a reminder of those who fell on 9/11; each time we sing it we feel it is a tribute to those emergency services personnel in the UK who have given their lives in the line of duty”. The workplace choir, comprising staff from across the organisation including firefighters, advocates, Prince’s Trust and control room staff and prevention team members, first featured on the BBC2 programme Sing While You Work. Since the series aired the choir has gone from strength to strength, performing in prestigious venues up and down the country as well as the Carnegie Hall and Ground zero performances. Parr Street Studios is a Grammy-award winning recording studio complex in Liverpool. Since their doors opened in 1990, they’ve worked with a long list of artists. Clients who have made records there include Beautiful South, Coldplay, Doves, Barry Manilow, Stereophonics, Russell Watson, Take That, Elbow, The Verve, Echo and the Bunnymen, Pulp, Space, and Paolo Nutini to name but a few.